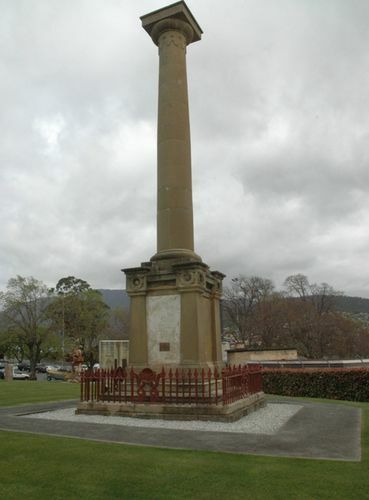 This monument is unique as it was the first war memorial to be erected in Australia and also the only such memorial to be erected by a British Regiment serving in Australia. The 99th Regiment of Foot was stationed in Hobart from 1848 to 1856. The monument commemorates twenty four men of the Regiment who were killed on active service in the New Zealand Maori Wars of 1845-46 and was erected, in 1850, from money raised by voluntary subscription from officers and men. A monument has for some short time past been in course of erection in the parade ground of the military barracks, to commemorate in perpetuity those of Her Majesty's 99th Regiment who fell in New Zealand during the severe operations in which the Regiment was engaged; in the years 1845 and 1846. Upon Monday last, the Commanding Officer (Col. Despard, C. B.) attended the formal laying of the first stone of the pedestal, and addressed the troops in allusion to the object before them, observing, that a good soldier who may fall in the service of His Sovereign and Country, will not be forgotten, but his memory will be held in grateful recollection, by his comrades who survive to share the laurels, he has assisted to purchase with his life. Colonel Despard then read the intended inscription, which was engraven on the plate, to be deposited within a cavity of the stone :-" This Pillar is erected by the voluntary subscriptions of the officers, non commissioned, officers, and privates of the 99lh Regiment, to record the names of their brother soldiers, both officers, non-commissioned officers, and privates, who fell in the service of their Queen and country during the campaign in New Zealand in the years 1845 and 1846 " The column is from a design by Mr Dawson, the architect of this city. Colonial Times (Hobart), 31 May 1850. This Pillar Was erected by the Voluntary Subscription of the Officers Non Commd Officers and Privates of the 99th Regiment to perpetuate the Memory of those brave Men of that Regiment who fell in the service of their Queen and Country during the Campaigns in New Zealand in the Years 1845 and 1846. This is the only monument in Australia erected by British troops to the memory of comrades who fell in action. The 99th Regt. of Foot, now the Wiltshire Regt., was stationed here from 1848 to 1856, under the command of Col. Henry Despard, CB.